The Girdle Book was the last item on my original list of historical-bindings-to-do, and now they are finally finished. I have experimented with the Girdle Book a few times before, but these are certainly the most refined. This is also the first time that I have used any embellishments. The dark brown book is made with deerskin, a very thin suede split. 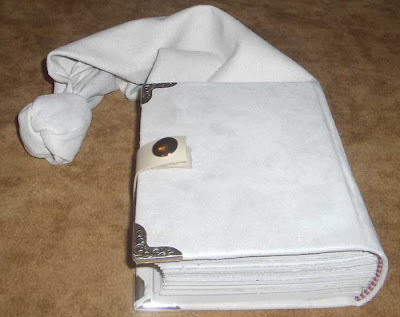 The white book is lambskin, also a thin suede split. These are not technically "bound" like Medieval girdle books. 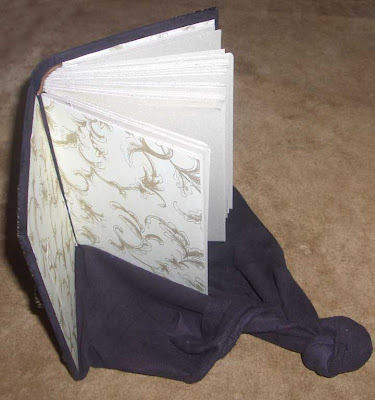 I just tried to make books that look like Medieval girdle books. In The Archaeology of Medieval Bookbinding, Szirmai dedicates a few pages to the girdle book. It is a late medieval book structure, most originating during the 15th century, and it was represented widely in paintings - there being over 800 documented visual depictions of the girdle book. In the artwork, it is usually being carried by biblical figures, clergy, monks, nuns, etc. There are just 23 extant girdle books now and all but four of these are religious texts (Szirmai 236-7). Generally, the girdle book was a small book, covered in leather with a long extension of leather at the bottom of the book. Sometimes the extension was left loose and just carried in the hand, or it was knotted so that the knot could be tucked under the belt (i.e. the girdle). So the book would be hanging upside-down. 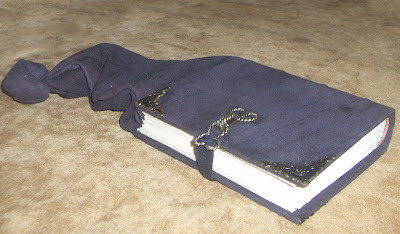 So if the carrier wanted to use the book, he could just reach down and bring the book up and it would be upside-right, and it never has to be detached from his belt. It seems like an efficient model. Imagine how easy it would be to read while traveling. If he was on the back of a mule (or whatever he would have been using), he could just read and not worry about dropping the book. As long as his mode of transportation has eyes, this would be ideal. Some of the girdle books were very plain, but there are some examples of highly decorated girlde books with brass corner pieces, engraving, tooling, ornate fastenings and clasps, and maybe even a coat of arms or other adornment in the center of the cover. I kept my books embellished with the basics: corner pieces and one fastening. Medieval books typically had two fastenings - but I just play the "artistic license card" whenever necessary. Oh! These are great ones! The history is fascinating, the books stunning and your passion for your art enriching to read about. I really like your beautiful books. I would like to try my hand at making some of those leather bound ones. Can you tell me where to buy ready-cut leather pieces? Are they all sold as whole skins? What type of leather would you recommend for a beginner like me? Hi cilla, thanks for your interest in my books! Some art/craft supply stores sell pieces of leather but any that I have seen are small and thin. Typically it is sold "by the hide" which is how I buy it now and I have to buy my hides online since there doesn't seem to be any local supplier. There are some small hides, though. Depending on the critter, hides can range from 4 to 40 square feet. The type of leather depends largely on the type of book you want to make. Cowhide is usually a bit stiff, so it makes a good book cover all by itself. 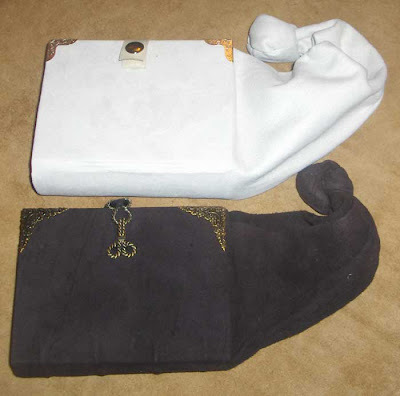 If you want use leather to make a hardcover book, you have to get much softer and thinner leather like goat or sheep. Apparently kangaroo is good too although I've never used it...there's not a great supply of it in this hemisphere. When I first wanted to make some leather books, I didn't know how to buy leather so I bought second-hand leather clothing and it worked really well. That might be a cost-effective source of leather for you to start with. Then you can call your books "upcycled" or "repurposed"! Rhonda they look terrific. I have some very soft, quite thin skins that my Sydney leather dealer calls American sheep - not sure what the real name would be. I think they'd be just right for girdle books. Isn't Szirmai the most wonderful resource? How do you do the Knots at the end?